Budget Barbie: Stopping the Neighborhood Kids From Coming Over All the Time! Stopping the Neighborhood Kids From Coming Over All the Time! Here's an incredibly frugal, cheap solution to the age old problem of having the neighbors children constantly at your house wanting attention, snacks, play time, drinks.... attention. I used to be the "Kool Aid Mom" of the neighborhood and although I tried to be welcoming and accommodating we had issues with the kids of two different families. By 7:00 - 7:15 am our door bell would start ringing with "Can your kids play?" "Are they up yet?" "When can they play?" "I see bananas! Can we have one?" And my suggestions of "come back after 12:00" or "Not today" or "In 2 hours" were met with the doorbell ringing every 20 minutes with questions like "Has it been 20 minutes yet?" "Is it 12 yet?" "is it time yet?" I solved the problem by making up a sign for the door. One sign said "Ring the Doorbell, we can play!" 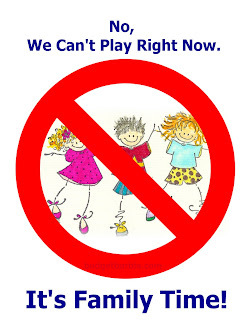 and the other had a large red circle with a line through it and the words "No we can't play! It's Family Time". I would place the correct sign in the glass of the front door at the children's height and even though I had to show the 3, 4, 5 and 6 year olds what it meant, they soon 'got it' and our doorbell wouldn't ring at 7:00 am nor would we be barraged with unwelcome visits during every mealtime. This worked great for times when my kids wanted to only play with each other, swim in the pool, watch a movie or when we did special Mommy and Me crafts or decorated cookies, etc. as well as when the baby was sleeping and we needed quiet time. Click on the graphic to make it full sized and you can print it off and give it try at your own home!